Yipeeeee. Second block on the Moogly CAL issued this week. Booooooooo, I can’t do it yet as I have a painful arm! Had tennis elbow for a while now but had an injection in it yesterday and have to rest it for the weekend! I love that block. 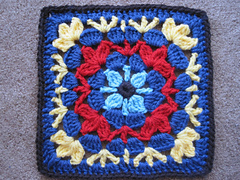 It is just the pretty type that inspires me to learn crochet.